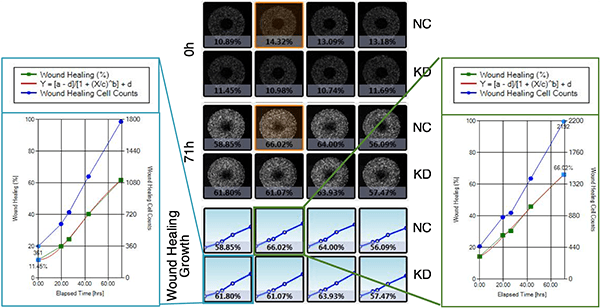 In a wound healing migration assay, a wound is produced on a fully confluent cell layer by a mechanical tool or by a device inhibiting cell growth in a defined area. Celigo is used to image the entire well with a wound at multiple time points. Confluence is automatically calculated for each well. 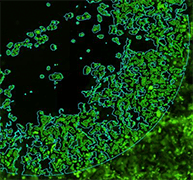 The increase of confluence directly measures cell migration. 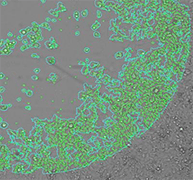 Removing the well stopper leaves an exclusion zone into where the cells migrate. 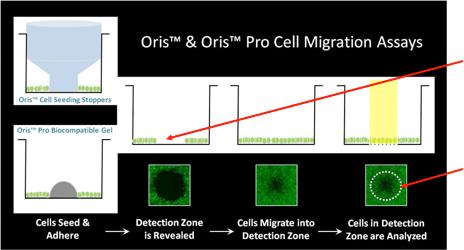 The Celigo detects cell migrating into the exclusion zone either in bright field or fluorescence. 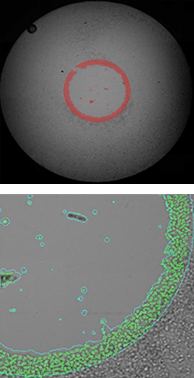 Whole-well images are acquired and the analysis area is defined by the Celigo software. 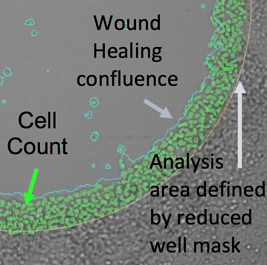 The Celigo Wound Healing application reports the wound healing confluence and cell count for each well over time within the defined analysis area. Plate cells. 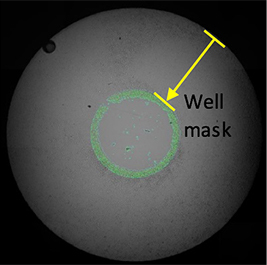 Remove stopper and Image whole well in fluorescence. 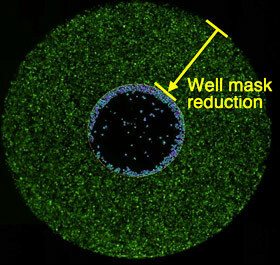 Analysis area is defined by reducing well mask size (36% of the total well area). 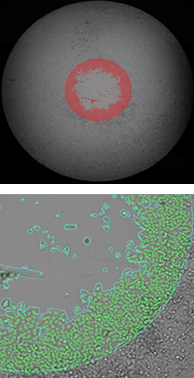 Celigo measures and reports the confluence and cell count within the analysis area. 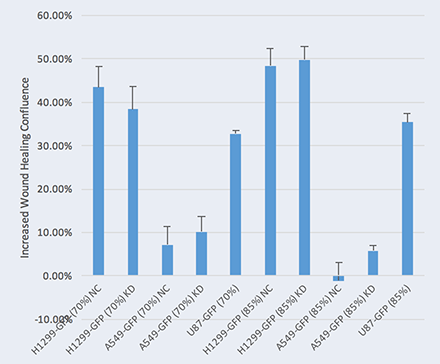 Two seeding densities were tested: 70% and 85%. These seeding densities refer to the confluence of the original plate that was used for seeding onto the Oris plate. 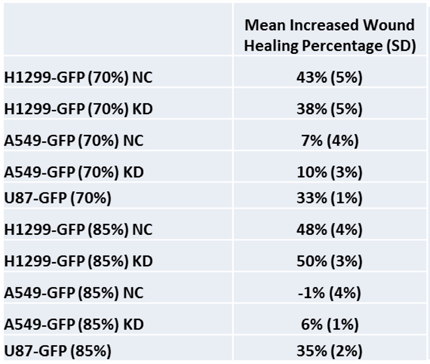 Data indicates that similar wound healing trends were seen for both 70 and 85 percent confluent samples. 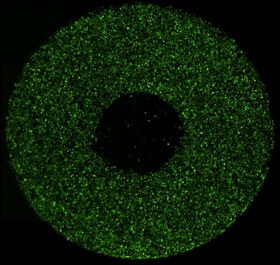 In the table below, A549 cells appear to have migrated the least into the wound compared to other cell types in the study. Plate cells. Remove stopper and image whole well in bright field. 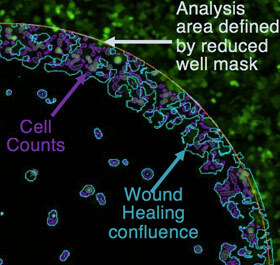 The Celigo Wound Healing application reports the wound healing confluence and cell count for each well over time using bright field imaging without requiring dye staining or GFP transfection. 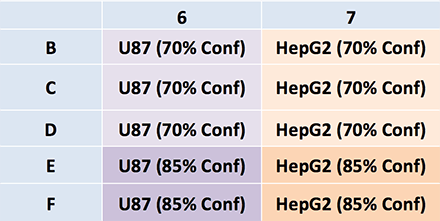 U87 and HepG2 cells were plates at initial confluence measurement of 70 and 85%. 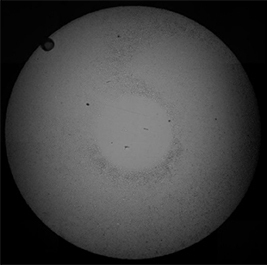 The top row of images shows the whole-well bright field image with fill. 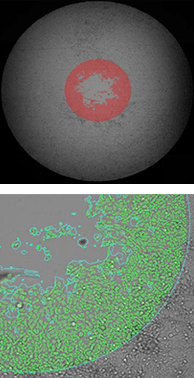 The bottom row shows a zoomed view of the segmentation. 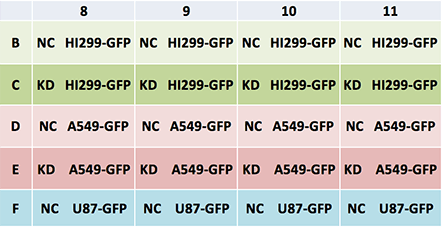 Two seeding densities were tested 70% and 85%. These seeding densities refer to the confluence of the original plate that was used for seeding onto the Oris plate. 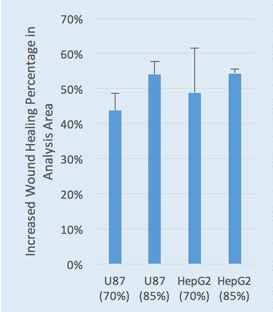 Data indicates that similar wound healing trends between U87 and HepG2 cells were seen for both 70 and 85 percent confluent samples. 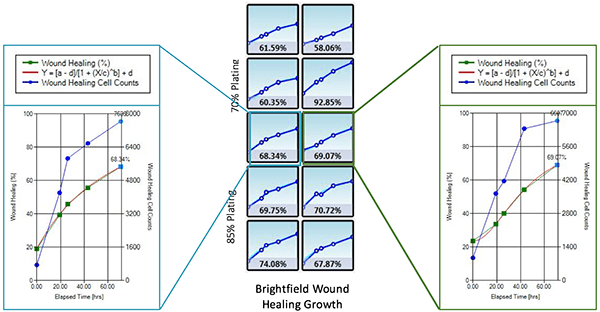 Wound healing confluence between Bright Field and Fluorescence analysis showed no significant difference between the two analysis methods. 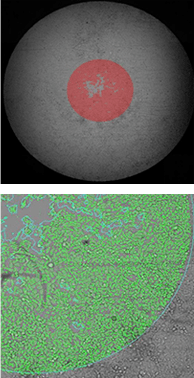 The diagram shows the area of the well shown in zoomed images 0, 4, 8, 24 and 31 hours. 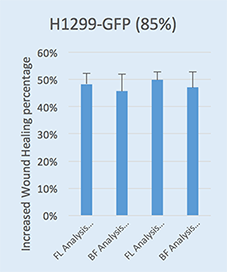 The Celigo wound healing application reports the wound healing confluence and cell count for each well.